Our emphasis is teaching fundamentals in small groups, not on competition. Our exceptional staff includes track & field college coaches who are specialists in their events. There is a trainer at all sessions. Our goal is to make sure each attendee leaves with added knowledge in his/her ability to accomplish the fundamentals necessary to improve performance. All track & field schools are for boys/girls, high school and college athletes plus Masters' competitors. 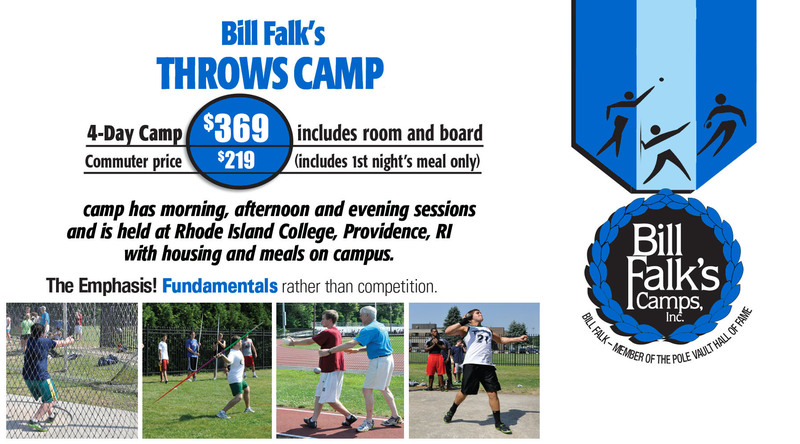 Tuition for all Bill Falk's schools includes School T-Shirt, instruction and insurance. Your deposit will be refunded if you cancel 2 weeks prior to the camp date. No refunds after that date. Bring your pole or implement if you wish, or we will provide one for you! 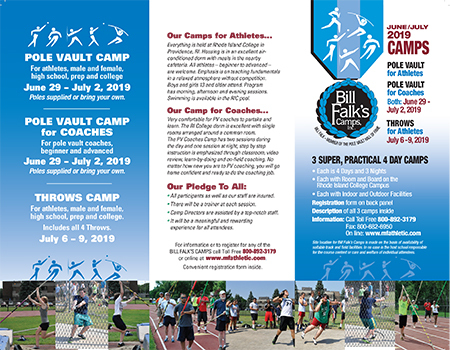 Elected to the National Pole Vault Hall of Fame, Bill has coached many outstanding vaulters including Bill Deering (19’ 1/2”) and Mark Strawderman (3x all-american). Bill has developed an easy to follow method of teaching the event. There is no competition at his camps – instead emphasis is on teaching fundamentals in a relaxed atmosphere. Attendees receive expert instruction and learn what they need to work on and improve their technique.